Mass protests have raged since the global financial crisis of 2008. Across the world students and workers and environmentalists are taking to the streets. Discontent is seething even in the wealthiest countries, as the world saw with Occupy Wall Street in 2011. Protest Inc. tells a disturbingly different story of global activism. As millions of grassroots activists rally against capitalism, activism more broadly is increasingly mirroring business management and echoing calls for market-based solutions. The past decade has seen nongovernmental organizations partner with oil companies like ExxonMobil, discount retailers like Walmart, fast-food chains like McDonald’s, and brand manufacturers like Nike and Coca-Cola. NGOs are courting billionaire philanthropists, branding causes, and turning to consumers as wellsprings of reform. Are “career” activists selling out to pay staff and fund programs? Partly. But far more is going on. Political and socioeconomic changes are enhancing the power of business to corporatize activism, including a worldwide crackdown on dissent, a strengthening of consumerism, a privatization of daily life, and a shifting of activism into business-style institutions. Grassroots activists are fighting back. 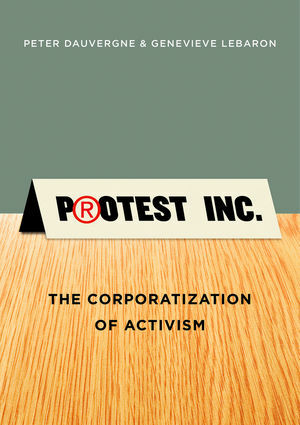 Yet, even as protestors march and occupy cities, more and more activist organizations are collaborating with business and advocating for corporate-friendly “solutions.” This landmark book sounds the alarm about the dangers of this corporatizing trend for the future of transformative change in world politics. Peter Dauvergne is professor of international relations at the University of British Columbia, and author of the bestselling The Shadows of Consumption (2008), which received the Gerald L. Young Book Award in Human Ecology. Genevieve LeBaron is Vice-Chancellor's Fellow in politics at the University of Sheffield. "A gloomy, gripping, book, full of disheartening statistics. The essential message of the book is pretty clear - 'the rich are winning'." "A tremendous book - hard-hitting, passionate, and beautifully written - that deserves to be read by everyone who is interested in social change. The authors investigate how corporate values and behaviors are weakening the impact of global citizen action. We must heed their call." "This original and compelling book provides a much needed wake-up call about the creeping de-radicalizing influence of big business on activism in the contemporary world." "Speaking the truth to power risks leaving you with the truth and them with the power. Much as the corporate model of organizing production affects and infects so much else in modern society, this fine analysis shows how it has done the same to many of its social critics."